Feeling a bit overwhelmed by the cliquish Pan Hellenic circle, I dove into Greek life as though I were just hitting the fictitious Cyprus Rhodes University as a transferring townie. Luckily I wasn't alone and I arrived alongside two other new students joining the cast of ABC Family Channel's addictive series in the fourth chapter DVD release that takes us to the end of the second season. 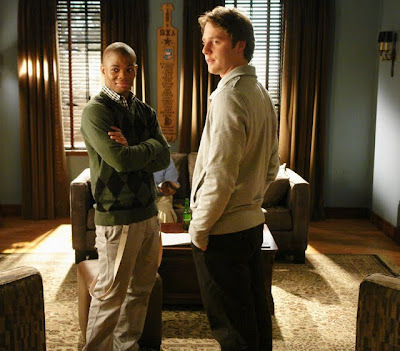 As a viewer who'd never caught a second of the series previously, I joined football star freshman Andy (Jesse McCartney) and beautiful community college transfer student Jordan as my audience surrogates and fellow newbies navigating the terrain of the histories, mysteries and relationships of the individuals who dominate Greek row. Luckily, the series is filled with likable characters, especially in the form of our Monica and Ross like anchors of the wise, older sister Casey who is the conscience behind the loyal President Ashleigh of the ZBZ house and her brainy brother Rusty who shed his John Hughes nerd image by joining the good-natured slackers who live at the KT house. Still, more than just as fun and fresh as you'd expect for the younger demographic, Greek is also exceedingly well written. Bursting with jokes ripped from the latest episode of TV's Extra or any given “Breaking News” story on the E! 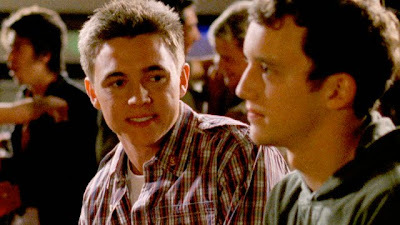 Channel, the series is so cleverly written that an episode minus a dead-on observational reference to similar series like 90210, Dawson's Creek or Felicity feels as wrong as dirty rushing new students before it's time to bid for new pledges. Likewise, as evidenced in this three-disc, slim-packaged DVD set, Greek manages to hook you with the same adhesive properties of traditional evening soaps that consist of love triangles and misunderstandings. Yet more impressively, it also drops in enough lighthearted laughter to make the series as enjoyable as gossiping with friends after a long, hard day of cramming for tests and avoiding the girl who cruelly reminded you it's time to touch up your roots. Kicking off twelve episodes with a breathlessly fast-paced and hard to follow recap that runs the length of a commercial spoken at warp speed, we find Casey reunited with her boyfriend Max who-- unbeknown to her-- has given up grad school at CalTech for the chance to see where their one month relationship will go. Feeling the need to not let herself get as caught up in the Pan Hellenic life as she'd previously been, especially after a Washington D.C. internship found her dubbed Elle Woods, Casey rents an apartment, vowing to become much more studious this time around. Predictably, this decision lasts all of a day when she once again can't resist the drama of Greek Row after discovering that Rebecca has pretended to leave their ZBZ house and defect to nemesis Frannie's IKI (nicknamed “Icky”) sorority in order to spill all of their secrets. With the sweet yet none-too-bright Rebecca firmly in place as a mole, Casey and Ashleigh are soon engaging in Woodward and Bernstein like behavior of meeting in parking garages to get the dirt. Meanwhile, no longer a freshman pledge and ready to be an "active," Casey's brother Rusty is relishing in life as a sophomore especially when he thinks that he's found the best addition to his laid back KT house in his friend Calvin's high school classmate Andy. While Andy is essentially torn between two houses, that's the least intriguing triangle of Greek: Chapter Four as love triangles abound including Andy, Rusty and fellow newbie Jordan as well as Casey, Max and Cappie and new relationships begin and end for Rebecca, Ashleigh and Frannie. Amusingly, even the purity pledge, religiously devout student Dale finds that Jesus is no match for a cougar in real estate. Although the series touches on some of the traditional college themes of struggling to fit in, finding out who you are and how to handle the pressure of various commitments simultaneously, overall or at least in this particular chapter, Greek avoids the opportunity to explore any serious issues that some students face when testing the waters of life away from home. Not as socially invested as the Canadian made Boston college set series The Best Years from the writers of Degrassi nor as narrowly focused on a specific segment of individuals like Gossip Girl, Greek offers something different than what's out there via a frankly TV-14 rated series most kids wouldn't want to watch as a traditional ABC Family program. Yet with its emphasis on lighthearted dramedy as opposed to unrealistic Melrose Place or Desperate Housewives style sabotage, it reminds viewers that along with the first taste of freedom as adults, college still offers boundless optimism and discovery, along with the expected cliques, classroom dramas, and friends who-- before you know it-- become a second family.